In a bowl, combine all crust ingredients and mix them well until everything is evenly distributed. Press the crust mixture into the cake pan/baking tray and compress it until you get an even layer. Refrigerate for at least ½ hour. In a food processor, blend the raspberries. In a food processor (no need to wash it in between! ), blend the soaked and drained cashew nuts until completely smooth. Add the raspberry puree and the maple syrup to the cashew cream, and blend until everything is well-combined. If the mixture is too thick, add the water you soaked the cashew nuts in, 1 tbsp at a time. I’ve added 12 tbsp in total (I don’t recommend adding more than that). The final consistency of the cheesecake filling should be like a thick cupcake batter. 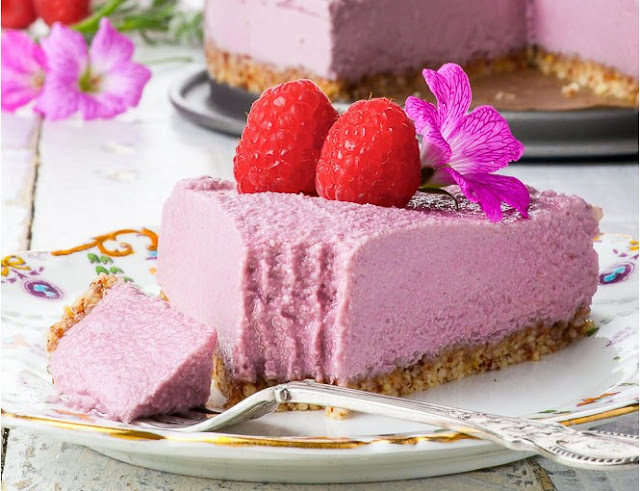 Transfer the raspberry cashew cream onto the almond crust and smooth out the top. Allow to set in a freezer overnight. Remove the cheesecake out of the cake pan/baking tray by lifting out the bottom. The cheesecake filling may stick to the sides of the cake pan/baking tray. If that happens, allow it to thaw slightly (about 5 – 10 minutes) and try to remove it again (warming it with your palms helps). Cut a piece and tuck in!